In one blaze, a Nassau firefighter suffered a head injury, an official said. Several people were hurt in various fires Monday as icy temperatures and winds tested the mettle of Long Island firefighters with water that froze under their feet and fast-moving flames, authorities said. In one of five Nassau blazes, one firefighter suffered a head injury at a Hewlett Neck blaze when he slipped on water that had iced up as firefighters from five departments aimed their hoses at an Ocean Avenue home just after 11 a.m., said Michael Uttaro, Nassau County assistant chief fire marshal. He was expected to be released from the hospital Monday night, authorities said. Two other firefighters suffered minor injuries but did not have to go to the hospital. "As soon as you're putting water down on the fire, it turns to ice everywhere," Uttaro said. A malfunctioning boiler appeared to have started that blaze, but at a Henhawk Road home in Baldwin, a space heater that was too close to combustible material caught on fire about 8:45 a.m., sending one resident to the hospital with minor burns, authorities said. Four departments battled flames, officials said. Uttaro said he expects more weather-related fires this winter as people try to stay warm with heaters, fire places and other methods. In Carle Place, the fire that started about 6:30 p.m. on Curtis Avenue quickly turned into a four-alarm blaze that prompted local fire department to call in four other departments, authorities said. Other details were not immediately available. "They had fire coming out of the front and back," Uttaro said. One burned resident was treated at the hospital, he said. Several departments were called in because officials feared 40 mph gusts would drive the flames to adjoining homes, he said, but the fire was confined to the house. Minor fires were handled in Long Beach and Farmingdale, Uttaro said. 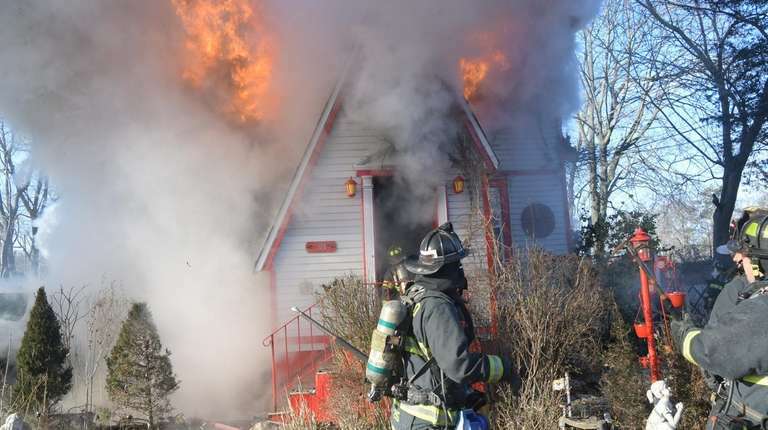 In Wyandanch, firefighters from two departments battled a blaze on South 29th Street but no injuries were reported, according to the Suffolk County Department of Fire, Rescue and Emergency Services. Other details were not immediately available.